The RV Box camera Has a 120° Degree viewable angle, its waterproof and has auto night vision. The camera is one of the most durable we have, with incredible adjustability and night vision clarity. The RV Box rear view camera has a metal sun shield visor to protect you from glare and pebbles. This is by far our toughest built camera. It has been regularly used in trucks, vans, buses, RVs and even industrial sized caterpillar trucks, operated in the harsh oil sand of Canada. This camera can take a direct hit from a rock and it will still work like new. It has also been very popular with RVs, because its housing allows you to install the cameras on multiple sides of your RV. 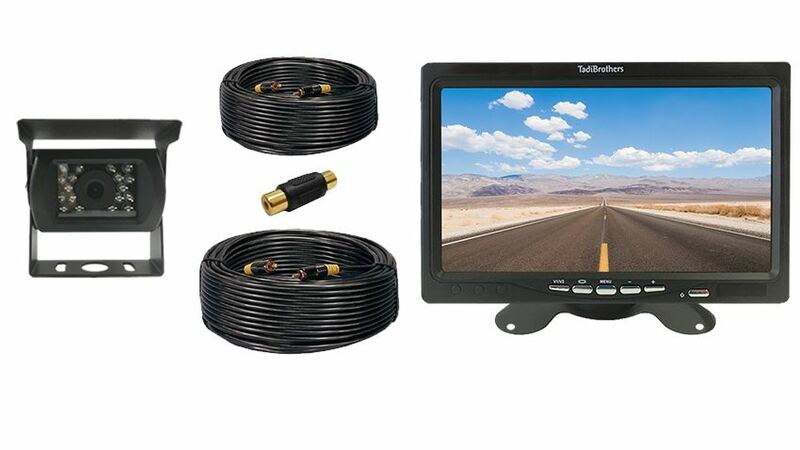 The fifth wheel backup camera system includes all parts necessary to connect a One camera system to your Truck and 5th Wheel. You connect the box camera to the top part of your 5th wheel (Photo 1.) You then run the 70ft cable provided (Photo 2.) from the camera at the back of your 5th wheel to your hitch. At that point you connect the 70ft cable to a second 20ft cable (Photo 4.) with the adapter provided (Photo 3.) That 20ft cable connects to your monitor (Photo 5.) Now you can see the whole world behind you! The adapter allows you to disconnect the 5th wheel from the backup system (Photo 3.) when you are not towing it. "7" monitor system received today, installed, works perfectly - thank you so much! Lloyd"
"I needed a standard camera that will fit on 3 of my vehicles that i use to farm. This camera fit the bill. its birds eye viewgives me the perspective i need and i love the night vision. So far i have purchased 3 of these and my son in law has 9. We are both satisfied with the rear view camera"